A 55-year-old male patient reported with heaviness on the right side of the face, nasal discharge, and foul smell during breathing for 2 months. The family and personal history was not significant. His general physical examination appeared normal without any obvious deformities or abnormalities. Oral cavity examination revealed the presence of a grossly decayed upper 2nd molar tooth on the right side. A decayed tooth was removed, and the closure of the socket was done with the help of buccal advancement flap. After 1 month, the patient again visited us with the same complaint of heaviness on the right side of the face along with nasal discharge and headache. 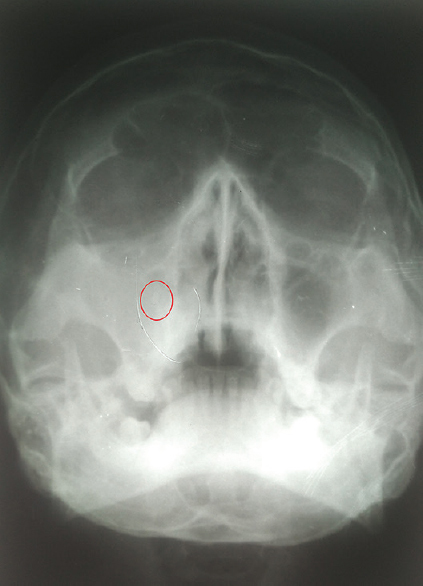 On radiological examination, the X-ray paranasal sinus (PNS), Waters' view [Figure 1] showed haziness of the right maxillary sinus. PNS revealed soft-tissue density in the right maxillary sinus. The provisional diagnosis of right-sided maxillary sinusitis was made. The patient was managed with parenteral antibiotics and planned for Caldwell-Luc operation. All the hematological and biochemical investigations were within normal range. Caldwell-Luc operation was done, and the multiple 4–5 small calculi (each around 0.7 mm × 0.3 mm in dimensions) were removed along with the antral polyps [Figure 2] from the right maxillary sinus and were sent for histopathological examination, which reveals it antrolith and polyp. The patient was started on intravenous cefuroxime 750 mg intravenous for 5 days twice a day, first dose being at the time of induction. The patient recovered in the postoperative period uneventfully. 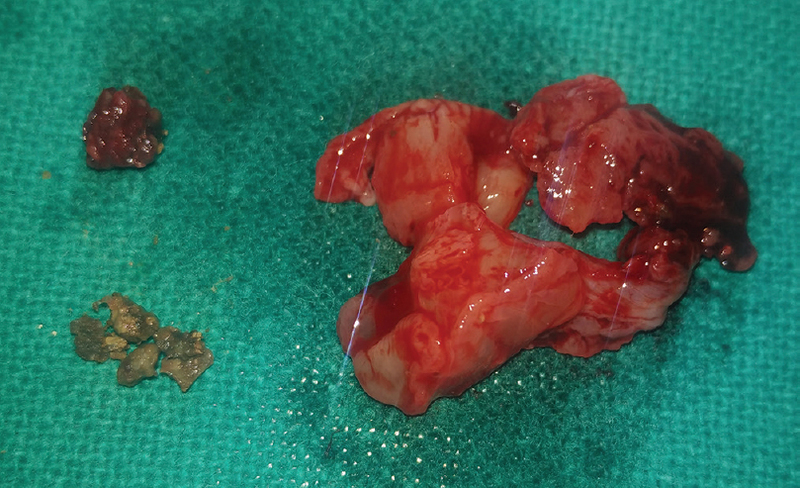 The total of 4–5 calcareous masses which were removed from the sinus were irregular in shape and freely lying in the sinus along with the polyps and were not attached to any wall of the maxillary sinus. Thus, we concluded it to be a sinolith/rhinolith in the right maxillary sinus, rephrased as an antrolith. Antrolith in the maxillary sinus is still a rare entity and is a cause of associated sinusitis with nasal discharge along with heaviness over facial region. Although rare, antrolith should be considered as a differential diagnosis of radiopacity in the PNS lesion. The diagnosis was made by means of PNS radiographs, nasal endoscopy, and computed tomography scanning. Stone can be removed either by an endoscopic approach or with Caldwell-Luc operation using either local or general anesthesia. Caldwell-Luc operation is a reliable procedure for the removal of a large antrolith in the maxillary sinus as it provides better exposure, ventilation, and drainage of the sinuses. Shenoy V, Maller V, Maller V. Maxillary antrolith: A rare cause of the recurrent sinusitis. Case Rep Otolaryngol 2013;2013:527152. Kanli A, Karagul S, Akkaya N. Maxillary antrolith: A case report. Hacettepe Dentistry Faculty Magazine 2008;32:103-6. Elangovan S, Srinivasa V. Maxillary antrolith: A rare cause of epistaxis. J Evol Med Dent Sci 2014;3:100-2. Haraji A, Mohtasham N, Zareh MR. Antrolith in the maxillary sinus: Report of a case. J Dent 2006;3:104-6. Nair S, James E, Dutta A, Goyal S. Antrolith in the maxillary sinus: An unusual complication of endoscopic sinus surgery. Indian J Otolaryngol Head Neck Surg 2010;62:81-3. Khare A, Devagiri V, Khadari SF. Pathological mass from maxillary antrum: A residual cyst. Oral Pathol Microbiol 2014;6:35-6. Ogata Y, Okinaka Y, Takahashi M. Antrolith associated with aspergillosis of the maxillary sinus: Report of a case. J Oral Maxillofac Surg 1997;55:1339-41. Guneri P, Kaya A, Calişkan MK. Antroliths: Survey of the literature and report of a case. Oral Surg Oral Med Oral Pathol Oral Radiol Endod 2005;99:517-21. Cohen MA, Packota GV, Hall MJ, Steinberg J. Large asymptomatic antrolith of the maxillary sinus. Report of a case. Oral Surg Oral Med Oral Pathol 1991;71:155-7. Akhlaghi F, Esmaeelinejad M, Safai P. Etiologies and treatments of odontogenic maxillary sinusitis: A Systematic review. Iran Red Crescent Med J 2015;17:e25536. Peral-Cagigal B, Redondo-González LM, Verrier-Hernández A. Invasive maxillary sinus aspergillosis: A case report successfully treated with voriconazole and surgical debridement. J Clin Exp Dent 2014;6:e448-51. Sugiura T, Yamamoto K, Nakashima C, Murakami K, Matsusue Y, Horita S, et al. Chronic maxillary sinusitis caused by denture lining material. Open Dent J 2016;10:261-7. Barros CA, Martins RR, Silva JB, Souza JB, Ribeiro-Rotta RF, Batista AC, et al. Rhinolith: A radiographic finding in a dental clinic. Oral Surg Oral Med Oral Pathol Oral Radiol Endod 2005;100:486-90. Bomeli SR, Branstetter BF 4th, Ferguson BJ. Frequency of a dental source for acute maxillary sinusitis. Laryngoscope 2009;119:580-4.